This is user interface design, or UI design for short. It’s important stuff, for as Steve Jobs famously said: “Everything in this world… was created by people no smarter than you” — and that’s particularly true in tech. Fraternize means to behave like a brother. Luke told me that. He said there was no corresponding word that meant to behave like a sister. Sororize, it would have to be, he said. The young ones are often the most dangerous, the most fanatical, the jumpiest with their guns. They haven’t yet learned about existence through time. You have to go slowly with them. Would like to believe this is a story I’m telling. I need to believe it. I must believe it. Those who can believe that such stories are only stories have a better chance. If it’s a story I’m telling, then I have control over the ending. Then there will be an ending, to the story, and real life will come after it. I can pick up where I left off. It isn’t a story I’m telling. It’s also a story I’m telling, in my head, as I go along. Tell, rather than write, because I have nothing to write with and writing is in any case forbidden. But if it’s a story, even in my head, I must be telling it to someone. You don’t tell a story only to yourself. There’s always someone else. Even when there is no one. I read about that in Introduction to Psychology; that, and the chapter on caged rats who’d give themselves electric shocks for something to do. And the one on the pigeons, trained to peck a button which made a grain of corn appear. Three groups of them: the first got one grain per peck, the second one grain every other peck, the third was random. When the man in charge cut off the grain, the first group gave up quite soon, the second group a little later. The third group never gave up. They’d peck themselves to death, rather than quit. Who knew what worked? 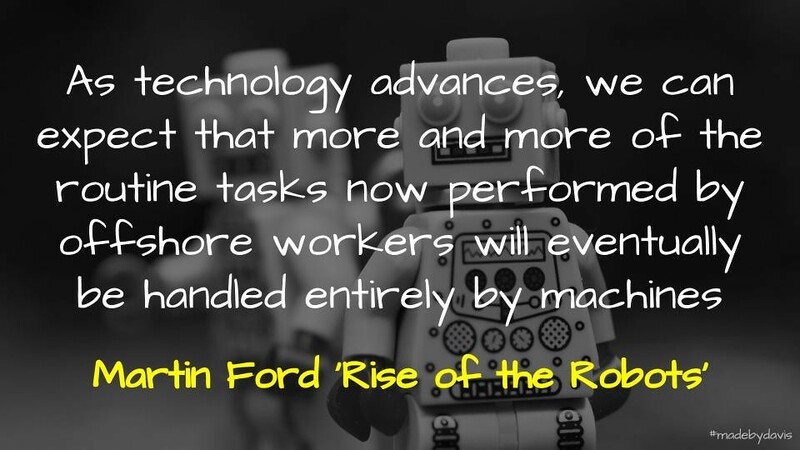 Detailing the rise of automation over time, Rise of the Robots by Martin Ford outlines a number of possible futures and the choices that we have. This is a part of the acceleration of technology and machine learning. This has led to improvements in productivity, but not in pay. The average workers are not benefiting. The implication of this is that there is less to spend on other things beyond beyond the essentials, which has a negative impact on the global economy. The reality of this situation is that the future is not set. A number of outcomes are on the cards. For example, if fast food and retail is automated then this could lead to mass unemployment, with the rich investing in gold rather than goods. Another possibility is a market based solution, where we embrace something like a negative income tax. Whatever the answer is, Ford argues that we need to adapt. As of 2013, a typical production or non-supervisory worker earned about 13 percent less than in 1973 (after adjusting for inflation), even as productivity rose by 107 percent and the costs of housing, education, and healthcare have soared. Machines themselves are turning into workers, and the line between the capability of labor and capital is blurring as never before. The top 5 percent of households are currently responsible for nearly 40 percent of spending, and that trend toward increased concentration at the top seems almost certain to continue. Jobs remain the primary mechanism by which purchasing power gets into the hands of consumers. If that mechanism continues to erode, we will face the prospect of having too few viable consumers to continue driving economic growth in our mass-market economic system. Vending machines make it possible to dramatically reduce three of the most significant costs incurred in the retail business: real estate, labor, and theft by customers and employees. From the perspective of any one individual, inequality can be very difficult to perceive. Most people tend to focus their attention locally. They worry about how they are doing relative to the guy next door as opposed to the hedge fund manager they will, in all likelihood, never encounter. Among the forces poised to shape the future, information technology stands alone in terms of its exponential progress. Even in nations whose political environments are far more responsive to the welfare of average workers, the changes wrought by technology are becoming increasingly evident. As the technological frontier advances, many jobs that we would today consider nonroutine, and therefore protected from automation, will eventually be pulled into the routine and predictable category. The hollowed-out middle of the already polarized job market is likely to expand as robots and self-service technologies eat away at low-wage jobs, while increasingly intelligent algorithms threaten higher-skill occupations. Moore’s Law is the best-known measure of advancing computer power, but information technology is, in fact, accelerating on many different fronts. For example, computer memory capacity and the amount of digital information that can be carried on fiber-optic lines have both experienced consistent exponential increases. Nor is the acceleration confined to computer hardware; the efficiency of some software algorithms has soared at a rate far in excess of what Moore’s Law alone would predict. While exponential acceleration offers valuable insight into the advance of information technology over relatively long periods, the short-term reality is more complex. Progress is generally not always smooth and consistent; instead, it often lurches forward and then pauses while new capabilities are assimilated into organizations and the foundation for the next period of rapid advance is established. There are also intricate interdependencies and feedback loops between different realms of technology. Progress in one area may drive a sudden burst of innovation in another. As information technology marches forward, its tentacles reach ever deeper into organizations and the overall economy, often transforming the way people work in ways that can further its own advance. Even if the advance of computer hardware capability were to plateau, there would remain a whole range of paths along which progress could continue. Information technology exists at the intersection of two different realities. Moore’s Law has dominated the realm of atoms, where innovation is a struggle to build faster devices and to minimize or find a way to dissipate the heat they generate. In contrast, the realm of bits is an abstract, frictionless place where algorithms, architecture (the conceptual design of computing systems), and applied mathematics govern the rate of progress. In some areas, algorithms have already advanced at a far faster rate than hardware. IT has evolved into a true general-purpose technology. There are very few aspects of our daily lives, and especially of the operation of businesses and organizations of all sizes, that are not significantly influenced by or even highly dependent on information technology. Computers, networks, and the Internet are now irretrievably integrated into our economic, social, and financial systems. Information technology, to a degree that is unprecedented in the history of technological progress, encapsulates intelligence. Computers make decisions and solve problems. Computers are machines that can—in a very limited and specialized sense—think. No one would argue that today’s computers approach anything like human-level general intelligence. But that very often misses the point. Computers are getting dramatically better at performing specialized, routine, and predictable tasks, and it seems very likely that they will soon be poised to outperform many of the people now employed to do these things. Today’s computer technology exists in some measure because millions of American middle-class taxpayers supported federal funding for basic research in the decades following World War II. We can be reasonably certain that those taxpayers offered their support in the expectation that the fruits of that research would create a more prosperous future for their children and grandchildren. Yet, the trends we looked at in the last chapter suggest we are headed toward a very different outcome. All this data arrives from a multitude of different sources. On the Internet alone, there are website visits, search queries, emails, social media interactions, and advertising clicks, to name just a few examples. Within businesses, there are transactions, customer contacts, internal communications, and data captured in financial, accounting, and marketing systems. The evaporation of thousands of skilled information technology jobs is likely a precursor for a much more wide-ranging impact on knowledge-based employment. I would argue that “free trade” is the wrong lens through which to view offshoring. Instead, it is much more akin to virtual immigration. When offshoring is viewed in combination with automation, the potential aggregate impact on employment is staggering. Innovations like MOOCs, automated marking algorithms, and adaptive learning systems offer a relatively promising path toward eventual disruption. the first place where self-driving cars make serious inroads might be exactly the area that directly impacts the most jobs. Workers are also consumers, and they rely on their wages to purchase the products and services produced by the economy. Markets are driven not just by aggregate dollars but also by unit demand. Eventually, technology will advance to the point where low wages no longer outweigh the benefits of further automation. The complexity that operates in the real-world economy is, in many ways, somewhat analogous to that of the climate system, which is likewise characterized by a nearly impenetrable web of interdependencies and feedback effects. The most important things—food, housing, energy, healthcare, transportation, insurance—are much less likely to see rapid, near-term cost reductions. There’s a real danger that households will end up being squeezed between stagnant or falling incomes and major-expense items that continue to rise in cost. one is nonetheless left to wonder just how long we have to wait before the promised labor shortages begin to put a dent in unemployment among younger workers. Consumer markets play a critical role not just in supporting current economic activity but also in advancing the overall process of innovation. While individuals or teams generate new ideas, it is ultimately consumer markets that create the incentive for innovation. In most areas, no amount of education or training—even from the most elite universities—would make a human being competitive with such machines. Even occupations that we might expect to be reserved exclusively for people would be at risk. It’s becoming increasingly clear, however, that robots, machine learning algorithms, and other forms of automation are gradually going to consume much of the base of the job skills pyramid. And because artificial intelligence applications are poised to increasingly encroach on more skilled occupations, even the safe area at the top of the pyramid is likely to contract over time.